Can Immunisations Affect Your Child's Eczema? As parents, you are given the choice if your child is given the program of vaccinations that is recommended. If your child has eczema you may have concerns and questions. One concern you may have is that your child will have a reaction to the vaccination, or that it could cause their eczema to flare up. Having an allergic reaction is rare, and further vaccinations should only be avoided if a severe reaction occurs. 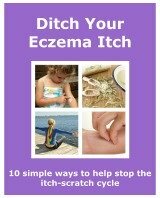 One problem is, is that there are so many things that can cause the symptoms of eczema to get worse. So even if your child has an outbreak of eczema after having a vaccine, it may be completely unrelated. A rash may appear after a MMR (measles, mumps and rubella) vaccination. Sometimes a measles type rash can occur for up to two weeks afterwards. If a rash appears after your child has been immunised, some small bumps may appear where the injection was given. But children with eczema are not affected by this anymore than children without it, and it's a common occurrence. Let your doctor know of any allergies that your child has, as there are extremely rare cases of an allergic reaction happening. Children with eczema can also be affected by food allergies. If your child has a severe allergy to egg, speak to your doctor. The MMR vaccination will be given with more care, and if you're travelling to an area where Yellow Fever is advised, then it probably won't be given. Depending on which area you live in, different vaccinations are recommended at different ages. You can also find out about the different vaccinations you may need when you travel.